As part of The Film Experience’s Montgomery Clift’s blog-a-thon I decided to write a thought-post on Joseph L. Mankiewicz’s film starring the man himself and two of the silver screen’s greatest actresses of all time: Liz Taylor and Ms Katherine Hepburn. 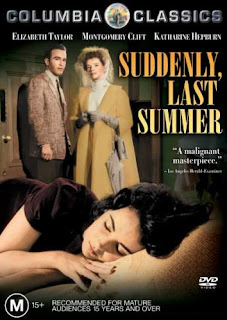 For anyone familiar with the drama of Tennessee Williams the fact that Suddenly Last Summer works to represent delusion as a mechanism for self-defense is not uncommon. Williams’ characters (mostly his Southern Belle heroines) are trapped in an infinite theatricality that sustains and destroys them. It is no wonder that, added of course to William’s own sexuality, his plays and characters have been taken up by the queer community as bastions of our own community’s conversations with itself over creating coherent narratives of our lives. Much more grim than that ‘other’ gay iconic narrative of going ‘over the rainbow,’ Williams seems to offer us, one could argue, a story where we are always dependent on the kindness of strangers… and sadly, in the instance of Sebastian Venable that doesn’t lead to a place where bluebirds sing, but on the contrary, a sandy white beach where Liz Taylor screams. 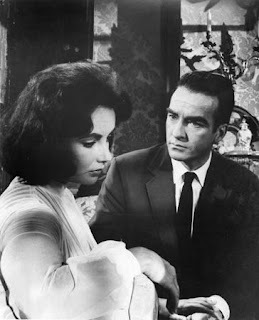 What is interesting to see at work in Suddenly Last Summer (the film) is of course the censoring of the queer aspect of Sebastian – which quite interesting at a meta-textual level, is left to Montgomery Clift (playing ‘Dr Sugar’) to unearth – though it is quite obviously left implicit in the movie we knew Sebastian liked boys: we’re told Sebastian met with ‘bright, young, beautiful, sophisticated people,’ that at the time when he died he was famished for blonds and that he used both his mother (played exquisitely by Hepburn) and his cousin (the luminous Liz Taylor) as ‘decoys’ to attract what we later see are scantily clad men (though the movie would never have put it that bluntly). Sebastian’s sexuality can be reconstructed of course by tapping into these tiny details, but I am interested in the ways in which M ontgomery Clift’s Dr. Cukrowicz is brought in not just to (re)create this narrative of sexual deviance, but also to (re)formulate it: ‘He would’ve been charmed by you’ he’s told by Mrs Venable and in that first act he is positioned in her eyes as one of those ‘bright young boys’ Sebastian would have been attracted to. And yet, this runs parallel to the way in which Mrs Venable also constructs Dr Cukrowicz as Sebastian (both ‘artists’ of some sort, both now taking care of Mrs Venable and Kathy) – something her delusion at the end of the movie will confirm. What I find intriguing most of all is how this is mediated by the movie: Clift’s Doctor is for most of the movie an audience – indeed his profession (a neuro-psychiatrist) demands he listen to Aunt Violet’s stories of Sebastian, to Kathy’s past memories and ultimately the movie works towards making the entire cast an audience for Kathy’s final exposition (which Mankiewicz is quick to turn into a flashback, highlighting our own audience-function). Clift is then left with the brunt of reactionary performance – he is stoic, poised and maintains an almost inexpressive exterior when he is propelled against the melodramatics of Hepburn and the antics of Taylor, and it is there that his performance of Dr Cukrowicz begins to turn into Sebastian. With his ‘beautiful, blue and frightened eyes’ Clift becomes for the two women in the play a ‘tabula rasa’ – a blank slate where the memory of Sebastian (as retold by Violet, by Kathy, as represented by the summer poems, the white clothing) can be projected and inscribed onto the doctor, so that by the end it drives Aunt Violet to the delusion that he is Sebastian, and where one can take that last scene (and his lack of resistance when encountering Aunt Violet’s initial identification of him as Sebastian) as a way of placing himself in Sebastian’s shoes – delusion is appropriated and (re)assembled as truth, if only momentarily to allow the credits to roll.